Product #17114 | SKU 80187 | 0.0 (no ratings yet) Thanks for your rating! 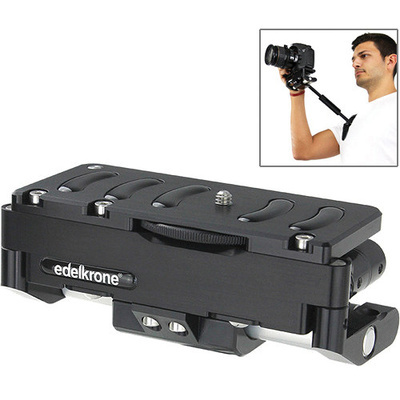 The edelkrone Pocket Rig 2 is a compact and portable DSLR base that folds out to provide a versatile support arm and 15 mm rods. It attaches to the bottom of your DSLR or mirrorless camera via a 1/4"-20 thumbscrew and has a form similar to a battery grip when folded, so it won't interfere with photo taking and traditional handheld work. It can also be used with compact camcorders. When you need more stability for video recording, simply fold out the Pocket Rig's fully adjustable support arm that functions as a chest/shoulder brace. By using the belt groove on the support piece, you can also use your belt to support the weight of the rig for stable shots with less arm fatigue. More than just a support arm, the Pocket Rig 2 also features 15 mm rods that can fold out in a matter of seconds, allowing you to attach a follow focus, matte box, handles, or other 15 mm rod accessories. The rods can extend up to 7"(17.8 cm). At the base of the rig is a 1/4"-20 threaded hole, allowing you to mount it directly onto a tripod or tripod plate and serve as a 15 mm rod baseplate for your camera.